If you play a Rogue, and if you raid on that Rogue at any difficulty level, then sheath your poison-tipped weapons, grab a steaming mug of Thistle Tea and pull up a chair, my friends. There’s a thing or two you should know about ShadowCraft. What are my character’s best stats for maximizing damage? What enchants and gems should I use? How much of a DPS upgrade is this gear over that gear? There are other tools on the Web that can help you answer the same questions — Ask Mr. Robot is among the most popular (and rightly so). But none of them have ShadowCraft’s combination of accuracy, reliability, and usability. One of the key attributes that set ShadowCraft apart is that it is the product of dedicated, brilliant players — players who also have both deep experience with and a passionate interest in the Rogue class in particular. 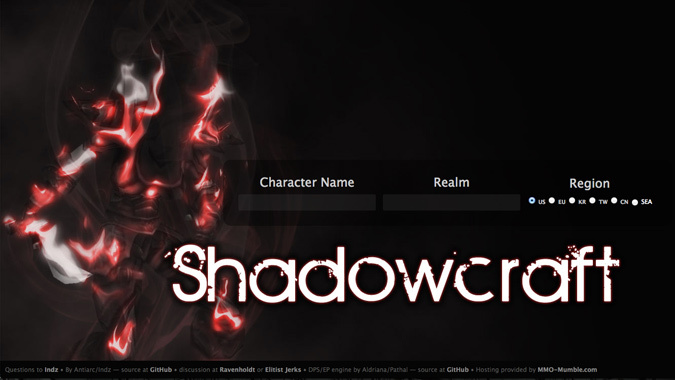 Although the ShadowCraft website was launched during the Cataclysm expansion, ShadowCraft’s origins are actually far older; the name itself is a nod to WoW‘s first set of raid gear for Rogues. 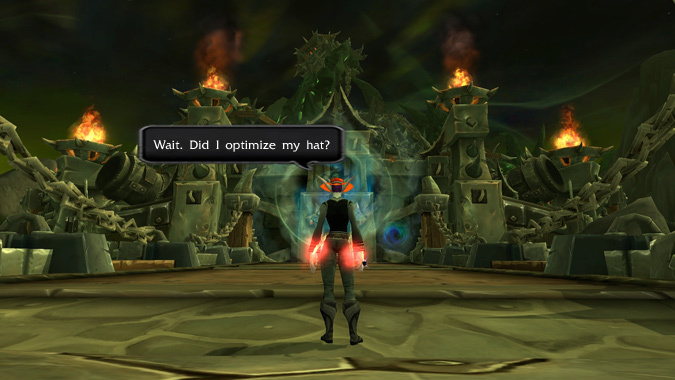 Many veterans of the class still fondly remember the gear optimization spreadsheets that had been created and maintained by a Rogue theorycrafter known as Aldriana, which date back to The Burning Crusade expansion. In 2010, Aldriana teamed up with a Rogue player and programmer known as Antiarc to create something that, at the time, was revolutionary: an online tool that allowed a person to import their character’s gear and then optimize it. In order to properly optimize a Rogue for raiding, though, a tool has to understand how a Rogue is played in raid fights — and it has to know how every single spell, talent, glyph and piece of gear interacts to deal damage. If you were to take a gander at the configuration files that make ShadowCraft tick, you would see thousands of lines of code that describe the math behind every aspect of a PVE rogue’s virtual existence. It’s intricate, challenging, painstaking work — and every time there’s a new class-relevant hotfix, patch change or expansion, ShadowCraft needs to be updated accordingly. Aldriana and Antiarc have long since moved on to other endeavors, but the spirit of their commitment to the class lives on in theorycrafters and technical gurus such as Fierydemise and Tamen, who maintain ShadowCraft today. It’s through their efforts, as well as those of a growing number of other dedicated players, that ShadowCraft is currently the most accurate tool we have to ensure Rogues can squeeze as much damage as possible out of their gear. Alright, I know. You didn’t come here because you wanted to learn about how ShadowCraft works. You came here because you want to know how to use it to murder things more. So be it! The basic steps you’ll want to take the first time you use ShadowCraft are usually the same, regardless of the purpose for which you’re trying to use it. 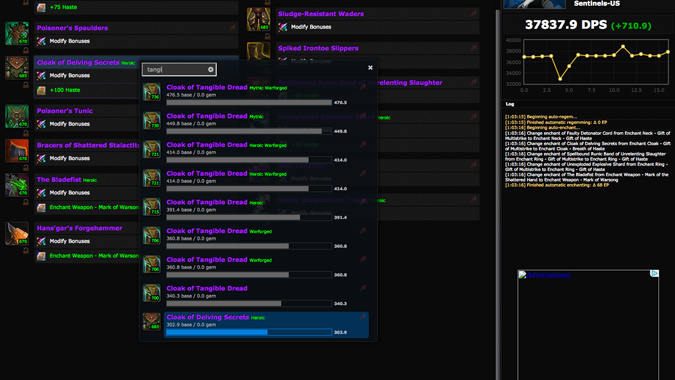 Log out of the game in the gear and specialization your Rogue uses for raiding. Enter your Rogue character’s name (including any special characters) and realm name, and select your server region. If everything worked properly, this will load your rogue into ShadowCraft in all its glory: In the middle of the screen, you’ll see each gear slot filled correctly, and if you click on the “Talents & Glyphs” tab at the top of the screen, your current build should show up. Instead, what that “DPS” number represents is the core of what makes ShadowCraft useful. It’s not intended to be an accurate reflection of the amount of damage your character puts out; what it will do is give you a starting point — that first dot on the graph — that will allow you to gauge how much potential damage you’ll gain or lose when you start optimizing. So. Now that you’ve imported your character into ShadowCraft, what questions can you use it to answer? What are my character’s best stats? This is the easiest, most straightforward service ShadowCraft provides. If you look over in the bottom-left portion of your screen, you’ll see a section called “Stat Weights.” Immediately underneath it, in order, you’ll see the value of each of your key primary and secondary stats. The higher the number, the more valuable the stat. 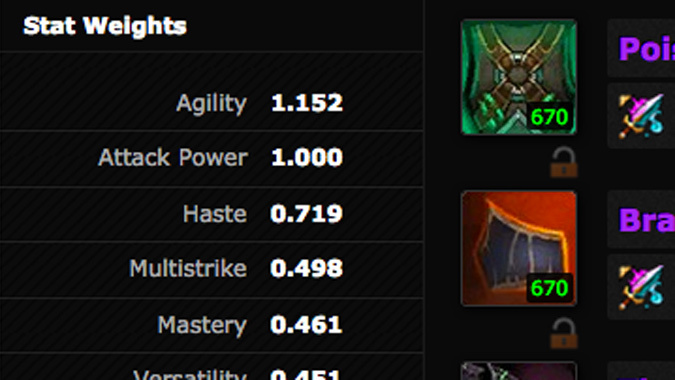 The really neat thing about these numbers is that they are your personal stat weights. They are completely customized for your Rogue at this moment in time. Stat weights are not permanent: They change every time you swap out a piece of gear, switch specs or alter some of your talents/glyphs. This is one of the features that makes ShadowCraft so unique, and so valuable: The recommendations it makes are based on stat weights that are entirely specific to you, like a custom-tailored suit. Now, it’s important to note that this doesn’t make the numbers you see foolproof. Yes, they’re based on a huge number of calculations and formulas crafted and updated by theorycrafters using the best knowledge players have available. But even the best theorycrafters are human, the game is constantly changing, and players don’t always have full information about exactly how certain spells work (or interact with one another). So remember that there’s going to be a certain margin for error in even our most accurate optimization tools; it’s just the nature of the beast. In the middle of your screen, you’ll see your gear update with recommended enchants and gems (assuming you have any gem slots to begin with). At the same time, on the right side of your screen, the “Log” section will fill up with an item-by-item recap of the enchants and gems that ShadowCraft just added or changed (so you’ll know exactly what to apply to your character in-game). The chart will add two new data points. 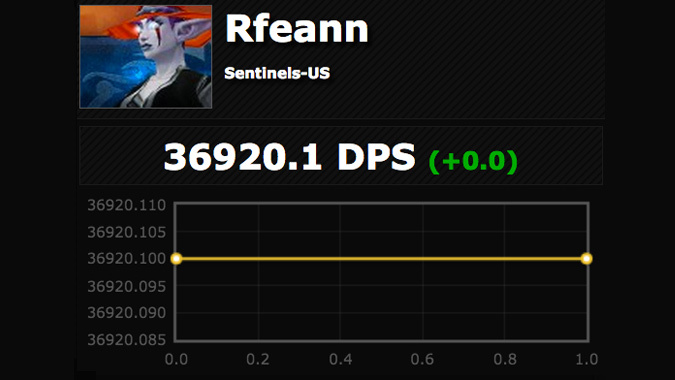 And that alluring, deceiving “DPS” number will go up. Now that you’ve learned how to optimize, you can start to experiment. Every one of the enchants and gems you see on your gear in ShadowCraft is clickable — and when you click on it, you’ll see a menu appear with a list of all the other enchants or gems available. Are you wondering how big a difference it’ll make if you go with a moderately expensive Greater Haste Taladite instead of one of those newfangled, super-fancy Immaculate Haste Taladites? Select each one from the menu, watch what happens to the “DPS” number on the right side of the screen, and decide for yourself whether the difference is large enough that the bigger upgrade is worth it. A word of warning: When you’re using those dropdown menus, make sure you actually select an item; don’t just rely on the numbers you see next to each item within the menu, because they’re just a loose approximation. By selecting the item, you ensure that your character’s stat weights will be recalculated around your specific setup, which will make the comparison between items far more accurate. How much of an upgrade is this gear over that gear? In the same way you just compared different types of enhancements, you can also compare different pieces of gear. 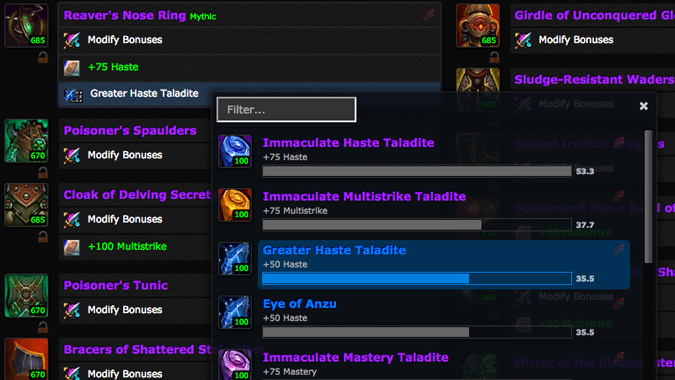 Click on the name of the piece of gear you’re thinking of replacing; a lengthy dropdown menu should appear. Select a new piece of gear from the menu (you can use the real-time search box at the top of the menu to help whittle down your options). You can get pretty much as complex as you want with this feature. I find it especially useful for answering questions about which trinkets are best for me to use within each spec, or to figure out when it makes sense to break a set bonus (or swap a previous raid tier’s four-piece bonus for the new tier’s two-piece bonus). Heck, I should hope so — I only answered three of the most common questions in this column, and ShadowCraft has a ton of nooks and crannies. 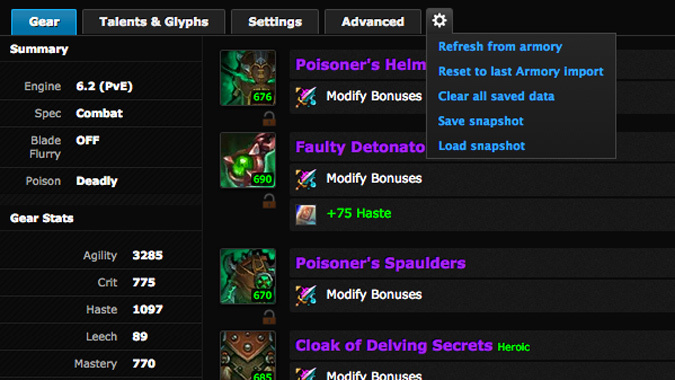 You can use it to explore the value of different glyphs, talents, raid buffs, and in some cases even aspects of your rotation. Click on the tabs up top and don’t be afraid to experiment. There are also plenty of cases in which ShadowCraft may not behave quite the way you want or expect it to. Much of the software is several years old at this point, and there’s a very small group of players out there with the time and expertise to improve it on a volunteer basis. (Usually, what time people do have is spent trying to ensure the ShadowCraft optimization engine is as accurate as possible.) If you find bugs, it can be helpful to report them. Although I’m happy to try answering some questions in the comments below, if you have specific questions, concerns or recommendations about ShadowCraft, the best places to go at the moment are the dedicated ShadowCraft forum on the Ravenholdt fansite and the #ravenholdt IRC channel, where Fierydemise and others who are intimately involved in ShadowCraft (and in Rogue theorycrafting) seem to check in pretty frequently. And if you’re interested in helping to improve ShadowCraft’s accuracy — or in getting more generally involved in rogue theorycrafting — there are a few words from Haileaus you should read. Until next time on Encrypted Text, be shadowy, my crafty Rogue friends.